The rewrite of the tax code keeps seven tax brackets, but drops nearly all of the rates. While the bottom rate remains at 10%, the highest rate falls to 37%, from the 39.6% it was in years past. Below are the federal tax brackets and rates you can expect for 2019. One of the largest changes with the passing of the Tax Cuts and Jobs Act, was the repeal of personal exemptions ($4,050 for yourself, your spouse and each of your dependents) and the significant increase in the standard deduction. 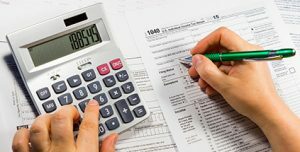 Changes to deductions, including the $10,000 cap on state, local and property tax deductions may make taking the standard deduction more attractive to tax filers than itemizing their deductions. The standard deduction nearly doubled, with an increase of $5,650 for single tax filers and those married filing separately, and an increase of $11,300 for those married filing jointly. Standard deduction for head of household also doubled, increasing $8,650 from 2017. With the new tax code personal exemptions are eliminated, but the child tax credit has increased to $2,000 per child under 17 years old and a $500 credit for non-child dependents. The child tax credit is potentially refundable, with tax filers benefiting from the credit even if they do not have any tax liability (up to $1,400 per child). You can estimate your 2018 federal tax liability by using our calculator. Also, look further at whether to itemize or take the standard deduction.